What's your favorite way to eat fish? Sliced raw as sushi, grilled and nestled next to rice, smoked and presented with crackers and a cocktail, served with coleslaw in a fish taco? Or maybe it's simply a tuna salad on whole-wheat bread or beer-battered with a side of fries. No matter how you like fish prepared, the good news is that eating fish can save your life. If the official word on seafood's health benefits still hasn't changed your order from steak to salmon, Dr. Dariush Mozaffarian, cardiovascular researcher and professor of medicine at Harvard Medical School, believes it's more effective to communicate what not eating fish can do to your health. "Avoiding seafood increases your risk of dying from a heart attack," he says. "There is a tenfold higher risk of sudden death from heart disease. This is mind-blowing." Oily fish such as salmon (wild and farmed), trout, mackerel, herring, anchovies and sardines are especially beneficial for heart health because they are excellent sources of omega-3 fats, specifically eicosapentaenoic acid and docosahexaenoic acid. White fish, such as cod, halibut and catfish, are healthy, too, but because they don't contain as much fish oil, you have to eat a lot more. For instance, it takes just two 3.5-ounce servings of salmon a week to average the 250 milligrams of EPA/DHA recommended per day, while you'd have to eat four servings of halibut or 10 servings of cod. 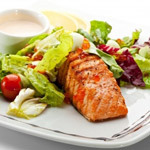 Two numbers that may shift your interest toward salmon and sardines compare fish intake with taking medications. "If you look at total risk reduction from cardiac death, fish oil consumption lowers risk by 36 percent," Mozaffarian says. "And that's comparable to taking statin drugs, which lower risk by 35 percent. Omega-3s from fish really should be the first line of treatment in primary prevention of cardiac deaths in the whole population." And he says don't stop at two servings a week if you're a seafood lover. "You can eat more to get even more benefits." Fish oil may even be more powerful than obesity. Research in the European Journal of Nutrition reports Eskimos in Alaska, who consume 20 times more fish-based omega-3s than the general U.S. population, seem to be partly protected from the harmful cardiovascular side effects of being overweight or obese. Research links to the heart are strong, but other associations for omega-3s and health are just emerging, including battling depression, improved immune function, joint health, brain development in children and age-related eye health. "Maybe those snake oil salesmen going from town to town in the Old West were actually selling fish oil," Mozaffarian says. "Their claims of a 'cure-all' might not have been totally off base." But before you reach for a bottle of omega-3 pills, note that eating fish will land you more than just fish oil on a plate. Fish and shellfish (exact amounts depending on species) are excellent sources of many other nutrients, including protein, vitamin D, vitamin A, vitamin B12, selenium and iodine. Mercury is a heavy metal found in nature from volcanic eruptions and as an industrial pollutant. Some fish contain more mercury than others, especially older and larger fish because they've had more time to be exposed to mercury. Pregnant women and young children are advised to limit canned albacore tuna to once a week and to avoid the top four mercury-containing fish: tilefish, shark, swordfish and king mackerel. But Mozaffarian says there's no reason for the general population to skip these fish because of their mercury concerns. "The benefits far outweigh the risk." Carolyn O'Neil is a registered dietitian and co-author of "The Dish on Eating Healthy and Being Fabulous!" E-mail her at carolyn@carolynoneil.com.